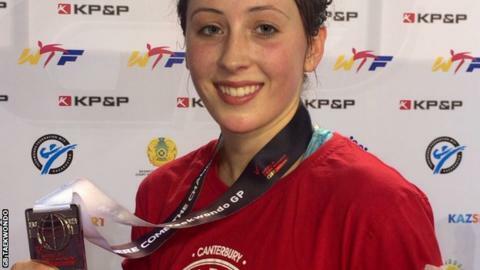 Great Britain's Jade Jones had to settle for silver in the -57kg category on the final day of the World Taekwondo Grand Prix in Astana, Kazakhstan. The 21-year-old from north Wales, who won Olympic gold in 2012, was defeated by Eva Calvo Gomez, who struck a golden point winner in the final. "I came here for the gold so obviously I am gutted," said Jones. "But I feel like I have improved a lot, especially beating world champion Sohee Kim by 12 points in the semi-final." Spaniard Gomez also defeated Jones in the first ever World Grand Prix at Manchester Central in December. "Eva has become a great rival and this time she was the better fighter on the day," added Gomez. "Hopefully, though, I can make it third time lucky in Manchester later this year. "I will go back to the gym now and work hard. There are still two years to the Rio Olympics and I know there is a lot more in the tank." Jones's silver was the third medal for GB in Astana after Mahama Cho also won silver in the +80kg category on Friday and Damon Sansum claimed bronze on Saturday in the -80kg category. But Michael Harvey and Martin Stamper both lost their opening matches at -68kg on Sunday.